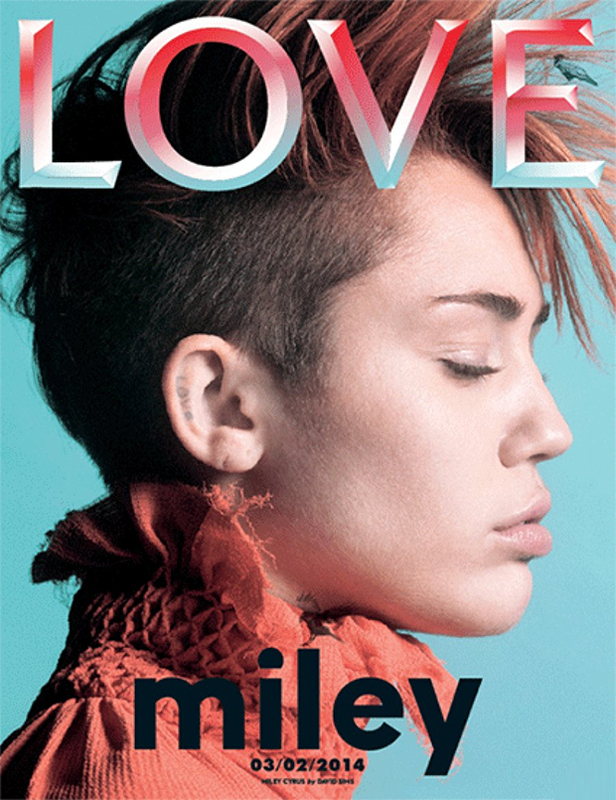 LOVE mag has just released a teaser cover for Issue #11, due out in March, which will apparently feature Miley Cyrus. I sort of begrudge LOVE for setting me up to talk about its Miley coup twice, but I guess that considering the pop star's current status as a permanent trending topic, vying for two rounds of pre-release hype is a smart move on the part of the publication. I just hope teasers don't become the norm. Still, this one was photographed by David Sims and shows Miley styled with a blood orange mohawk and matching rollneck sweater, her ear tattooed with the word LOVE. Whether or not the tattoo is fake, it's done in a 'stick and poke' style which, together with her punk-inspired hair, plays up the celebrity megastar's rebellious image. Of course, I question whether a true rebel would be caught dead posing on the cover of a fashion magazine, cool haircut color-coordinated with her turtleneck, lips tense with emoootion but I guess that's just Miley being Miley. Over in the forums, Melencholybaby suggests that Cyrus was possibly also photographed for the publication by Mert Alas & Marc Piggott, and might appear on the final cover in a wholly different guise. Though that's unconfirmed, Alas did post a couple photos of Cyrus (with bleached brows) to his Instagram and hinted that they were shooting for LOVE.